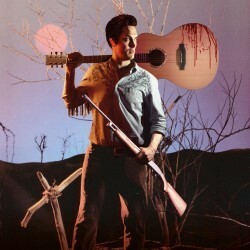 The cult comedy show The Elvis Dead combines horror with the songs of Elvis Presley. Long live the King! When Rob Kemp was nominated for Best Comedy Newcomer at the 2017 Edinburgh Fringe he missed the announcement and photo call. His day job as a school examinations officer meant he had to leave the festival for a few days to fill envelopes with students' exam results. This down-to-earth reason for his absence only added to the mystique which had gathered around the standup over that summer. On paper his show sounded like a parody of a Fringe show more than it did the real thing. Kemp would retell the 1987 horror film Evil Dead II as a one-man show using only the songs of Elvis Presley. The result of this odd juxtaposition was unexpectedly both bloody and hip. Without exaggeration it was the hit of the Edinburgh Fringe, selling out its run with Kemp playing to standing ovations. Although the connection between Sam Raimi's splatter movie and Elvis Presley is not as random as it seems. Evil Dead actor Bruce Campbell played an elderly, nursing home-bound Elvis in Bubba Ho-tep (2002). When friends joked that Kemp looked a little like Campbell all the elements were in his mind for a eureka moment. Having organised the rock n roll playlist to tell the story beat-for-beat the show could still have fallen by the wayside. The line between novelty and innovation is a thin one. And who would this show appeal to? Would there be enough fans of the niche film to establish a nightly audience? And who wants to see The King’s back catalogue slashed in this way? As it happened The Elvis Dead appealed to everyone. This is down to Kemp. However bizarre the songs become to fit Evil Dead II’s narrative, the man can sing. Every performance also feels like watching someone focus all their energy on just getting through the night, like it’s his last night on earth, like the protagonist of a horror film.